Agricola et liberi per procellam pulveris in Cimarron Comitatu Oclahomae, 1936. Photographema: Arthurus Rothstein. Procella pulveris Stratfordiam Texiae anno 1935 appropinquat. Procella pulveris Spearman Texiae die 14 Aprilis 1935 appropinquat. Machinae sepultae in cohorte; Dallas Dacotae Meridianae, Maio 1936. Familia migratoria Texana habitaculum remulcatum in agello aperto habitat. Destitute Pea Pickers in California: Mother of Seven Children, Florentia Owens Thompson. 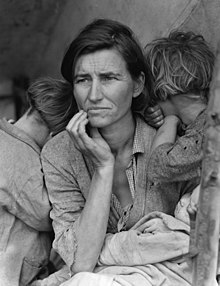 Photographema praeclarissimum a Dorothea Lange factum. Patera Pulveris fuit tempus tempestatum pulveris severarum quae oecologiam et agriculturam pratariarum Civitatum Foederatarum et Canadae per decennium post 1930 magnopere laeserunt; siccitas aspera et defectio rationum agriculturae siccae erosionem ventosam (rationes aeolianas) prohibere adhibitarum rem effecerunt. Siccitas tria culmina habuit, annis 1934, 1936, et 1939–1940, sed nonnullae regiones Planitierum Altarum status siccitatis octo annos cognoverunt. Lata intacti soli superioris Magnarum Planitierum aratio alta per priora decennia gramina endemica radices profundas habentia quae solum et humorem per tempora siccitatis et ventorum fortium usitate tenebant summoverat. Rapida instrumentorum mechanizatio, praecipue parva tractoria per benzinum acta et latus messoris coniuncti usus, sententias aridam terram gramineam (quarum multae minus quam decem uncias praecipitationis per annum accipiebant) ad cultam segitum terram convertere magnopere affeceruntt. Per siccitatem decennii post 1930, solum liberum pulveris factum est, quod venti obtinentes procul flabat in nubibus quae caelum aliquando nigraverunt. Hi strangulantes pulveris fluctus, "blizzard nigra" vel undae nigrae (Anglice black rollers) appellati, Urbs Novum Eboracum, Vasingtoniam Districtus Columbiae, aliasque urbes Orae Orientalis attigit, visibilitatem ad unum metrum vel minus saepe imminuentes. Robertus E. Geiger, diurnalista Associated Press, in Urbe Boise Oclahomae fortuite adfuit ut "blizzard nigra" Diei Solis Nigri, 14 Aprilis 1935, spectaret. Eduardus Stanley, editor nuntiorum pro Associated Press in Urbe Kansiae constitutus, Dust Bowl, vocabulum Anglicum, dum fabulam nuntiorum Geigeranam rescribebat. Siccitas et erosio temporis Paterae Pulveris 100 000 000 (400 000 km2) agrorum affecit qui panhandles Texiae et Oclahomae partibusque adiacentibus Novi Mexici, Colorati, et Kansiae nixi sunt. Clima Paterae Pulveris nonnulla deciens milia familiarum ut fundos reliquerent coegit. Multae harum familiarum, Okies (quia multae ex Oclahoma migrabant) saepe appellatae, ad Californiam aliasque civitates migraverunt, ubi mox cognoverunt Magnam Depressionem Oeconomica condiciones oeconomicas redidisse haud meliores quam condiciones reliquerant. Ioannes Steinbeck scriptor libros The Grapes of Wrath et Of Mice and Men ('De muris et hominibus') de talibus hominibus scripsit. ↑ Vel Cratera Pulveris. Etiam tempus Dirty Thirties a paucis Anglice appellata. ↑ Drought: A Paleo Perspective–20th Century Drought, National Climatic Data Center. 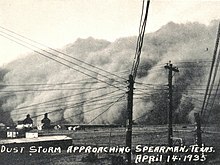 ↑ "The Black Sunday Dust Storm of 14 April 1935," (Norman Oclahomae: National Weather Service, 24 Augusti 2010). Egan, Timothy. 2006. The Worst Hard Time. Novi Eboraci: Houghton Mifflin Company. ISBN 0-618-34697-X. Gregory, James Noble. 1989. 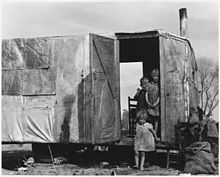 American Exodus: The Dust Bowl Migration and Okie Culture in California. Oxford University Press. Guthrie, Woody. 1963. The (Nearly) Complete Collection of Woody Guthrie Folk Songs. Novi Eboraci: Ludlow Music. Hakim, Joy.1995. A History of Us: War, Peace and all that Jazz. Novi Eboraci: Oxford University Press. ISBN 0-19-509514-6. Hesse, Karen. 1999. Out of the Dust. Novi Eboraci: Scholastic Signature. ISBN 0-590-37125-8. Janke, Katelan. 1935, 2002. 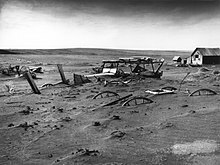 Survival in the Storm: The Dust Bowl Diary of Grace Edwards, Dalhart, Texas. Scholastic. ISBN 0-439-21599-4. Mencken, H. L. 1979. The American Language. Ed. Raven I. McDavid, Jr. Novi Eboraci: Alfred A. Knopf. ISBN 0-394-40075-5. Lassieur, Allison. 2009. The Dust Bowl: An Interactive History Adventure. Capstone Press ISBN 1-4296-3455-3. Lomax, Alan, Woody Guthrie, et Pete Seeger. 1967. Hard-Hitting Songs for Hard-Hit People. Novi Eboraci: Oak Publications. Reis, Ronald A. 2008 The Dust Bowl. Chelsea House. ISBN 978-0-7910-9737-3. Sanora Babb. 2004. Whose Names Are Unknown. University of Oklahoma Press. ISBN 978-0-8061-3579-3. Sylvester, Kenneth M., et Eric S. A. Rupley. 2012. Revising the Dust Bowl: High above the Kansas Grassland. Environmental History 17:603–633. Worster, Donald. 1979, 2004. Dust Bowl: The Southern Plains in the 1930s. Oxford University Press. ISBN 0-19-517489-5. Worster, Donald. 1982. 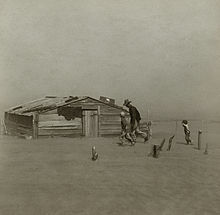 Dust bowl: The Southern Plains in the 1930s. Oxford University Press. Vicimedia Communia plura habent quae ad Pateram Pulveris spectant. Novissima mutatio die 15 Septembris 2017 hora 12:35 facta.